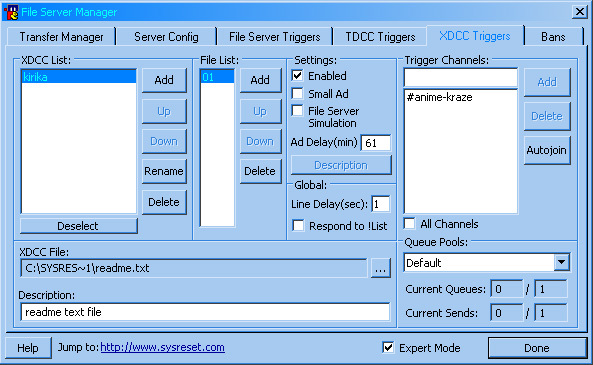 After getting used to using SysReset's TDCC's, XDCC's will look very familiar. They are just like TDCC's, except you have to have a XDCC pool, and multiple files. First, create a new XDCC pool. Click the Add button inside the XDCC List: menu, and enter the name for it. This is what goes in /ctcp yournick xdcc list <here>. Then, add the files to that pool. Click the add button in File List:, then select the file, and enter a description for it. Add more files to the pool this way. Inside settings, check "Enabled" to enable the XDCC pool. Select "Small Ad" if you do not want to advertise your xdcc with all the packs. Then you can set the message that comes after your ad by clicking "Description". File Server Simulation makes the server open a file server-like dcc chat for the files. This is rarely used though. Line Delay is how long the lines take to appear after another, usually set at 1-5 seconds. Ad Delay is how long it takes for SysReset to automatically show your ad, but you can set it at 0 and it will not show. Check "Respond to !List" if you want it to respond when users type !List, and so it won't just advertise itself. Now click Done, and you may now Force Advertise your XDCC's the same way as your File Server Ad or TDCC Ad. Right Click channel, Force Advertise, and now select "All XDCC's". To test if they are working, use Simulate Advertise. Servers Active also has to be set to either one of the top 3 options in order to work. Advanced: To force advertise an individual XDCC pool, count from the list of XDCC's that you have. If it is number 2, then type /xad 3 in a channel, and it will force advertise that XDCC pool only.